Nearly one in six people in Southeast Asia is a smallholder farmer, often working tiny, inefficient plots of just one or two hectares. They are among these countries´ poorest people. 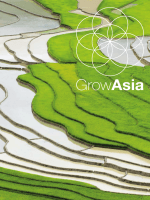 Grow Asia, formed a year ago by the World Economic Forum and ASEAN, is aiming to change that. It has partnerships with governments, farmers groups, NGOs and companies in five countries: Vietnam, Cambodia, the Philippines, Myanmar and Indonesia. According to Kavita Prakash-Mani, executive director of Grow Asia “ Our main aim is to look at food security in the Asian region through working with smallholder farmers. So how do we empower small farmers to really look at increasing their productivity through access to information, knowledge, finance, but also linking them to markets so they can also covert that productivity to profitability and incomes, and livelihood, and rural development,” They also aims to cut down on the excessive use of chemicals and ensure efficient water use to improve environmental sustainability and food safety.